Thanks to @WTH153 for this art piece! In the name of completion, we’re going through every single creature that popped up. To answer Sam’s question on last night’s Talks Machina (#45), 6 of the 11 creatures were in the first half of the Monster Manual (i.e., before page 176 of 352). With the exception of the unicorn, the rest were in the first two thirds of the manual. Hell hounds are fiends found throughout the lower planes like the Nine Hells, though their lawful nature would perhaps make them less inclined towards the chaotic Abyss. Though it is odd that they would be found on the Material Plane not in the service of a creature, that there were two hell hounds together is characteristic of their pack-tactic hunting. Only one hell hound had the opportunity to attack (and only because it was instructed to attack Trinket via ScanJan’s Dominate Monster). It elected to use its most damaging attack, Fire Breath, against Trinket, Vox’l’don and Ve’xel’ia before being dispatched. Doppelgangers are exactly what they sound like; shapeshifters that take the form of humanoids to blend in. Like rakshasa, doppelgangers have limited telepathic abilities to be able to read a target’s surface thoughts and occasionally delve deeper for their secrets. Most doppelgangers work alone or in small groups to swindle their victims, living off their wealth as long as possible. This one took on Grog’s appearance and traveled with the party until it could get one of them isolated and attack. Predictably, though, it was dispatched with ease once the players were aware of its true nature. Blights are plants contaminated by evil. These plants gain some amount of intelligence and mobility, and can take one of a few different forms. Twig blights in particular tend to root in soil when living prey is scarce, appearing, as we saw, like a woody shrub. Most twig blights tend to huddle in groups near campsites and watering holes to set up ambushes for unwary travelers. They also tend to be very dry, and are particularly vulnerable to fire. Pursey, however, didn’t need anything more than a sword for the single twig blight in his room. We wrote about mimics after some appeared in The Shrew’s mansion during The Screw Job. This mimic gave ScanJan a little bit of trouble until he blasted it with a lightning bolt, causing it to explode and leaving behind a greater health potion for his trouble. Animated objects come in many forms, from suits of armor to flying swords to, as we saw, rugs. Most rugs of smothering are designed as anti-theft devices meant to deal with unwary rogues, and can be disguised as carpets of flying for particularly greedy adventurers. Its primary method of attack, as we saw, is to wrap up and smother its victims, in this case Vox’l’don. Once he’d managed to wriggle free, however, he easily cut a rug, leaving it slightly unraveled on the floor. We last wrote about illithid way back when Vox Machina was escaping the Underdark. This mind flayer didn’t stand much of a chance against Pursey after he caught it in Manners (Iron Bands of Bilarro). It attempted to Mind Blast him, but Pursey has +5 for intelligence saves, and can use Indomitable to reroll saves he doesn’t like. Once it was restrained, the mind flayer was prevented from using tentacles on Percy even if he had failed the mind blast save and been stunned. We previously discussed cambion back when Vox Machina roamed the streets of Dis. We got to see more of the cambion’s attacks than when VM faced them previously. This cambion used his fire ray, fiery spear, and spellcasting (Command) against Vox’l’don. All told, the fiend dealt 30 damage to Vox’l’don before being taken out. Paladins are pretty good against fiends, especially flying paladins. ScanJan’s decision to polymorph into a triceratops was a fortuitous one: the t-rex’s bite allows it to grapple and restrain a creature...if the creature is medium or smaller. The triceratops, like the t-rex, is a huge creature, preventing the grapple. ScanJan’s use of Reverse Gravity smartly employed the damaging force field to do the work of hurting the t-rex for him, while also keeping the dinosaur out of attack range. Alas, the t-rex was dispatched by the unicorn before it could fall to its doom. 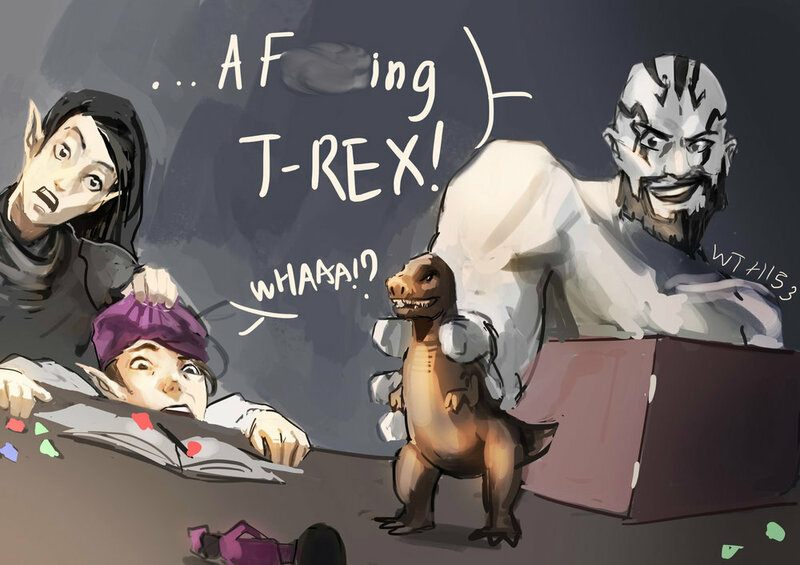 Despite Grog’s insistence and the unicorn’s persistent attacks, Ve’xel’ia refused to attempt a damaging attack on the lawful good creature. We got to see the unicorn use its melee attacks: hoof and horn strikes. We also got to see its spellcasting prowess, including Entangle, and the rare, once-a-day, uniquely unicorn ability to teleport up to five feet away! In the end, Ve’xel’ia’s pleas won the unicorn over, and it left the battlefield with the t-rex in tow. We wrote about lycanthropes back when Vox Machina ran into a pack of them in the Feywild. Grog apparently fought one affected by the wolf strain of the curse on his way up the tower, leaving him a werewolf. However, he was weakened by his trip up the tower, so it was almost too easy for Vox Machina’s characters to knock him out of wolf form, allowing Pursey to deal the finishing blow with his silvered sword.